Paul Biya (top left) Maurice Kamto (top right). The National Executive Committee of the Social Democratic Front met in Yaounde, Saturday October 3, 2018. Members of the National Executive Committee (NEC) of the Social Democratic Front (SDF) have begun assessing the party's participation in the October 7 presidential poll. The assessment exercise was one of the key points of a NEC meeting which took place at the residence of the National Chairman of the SDF on the outskirt of the city of Yaounde, Saturday October 3, 2018. After the in-camera meeting which lasted over eight hours, the National Chairman of the SDF, John Fru Ndi, told reporters they will continue to examine what went wrong with the party in the last presidential election. It was the worst performance of the frontline opposition party in a presidential election. The SDF's candidate, Joshua Osih, emerged at a distant fourth position with a little over three per cent. Paul Biya, Maurice Kamto and Cabral Libii performed better than the Member of Parliament who was seeking to be at the helm of the state. Fru Ndi said they will make public the conclusion of their finding once the assessment is complete. 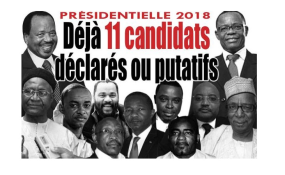 Quizzed on why top-notch members of the SDF party did not accompany Osih in his bid for election, Fru Ndi said some of them were sick and couldn't be with him on the field. "In the midst of poor health, they couldn't have done what they were supposed to do," the National Chairman said, then congratulated those who stood by Osih. On the issue of Osih congratulating his challenger Biya on his victory, Fru Ndi noted it was an internal party affair and declined to comment further. Insiders of the NEC disclosed that deliberations and debates at the meeting "were very frank, sincere and hot." It was an avenue for the NEC members to chart a way not to have the type of poor result they had in future elections. Resolutions of last Saturday's meeting were yet to be officially released by press time.